"There is no feeling more comforting than knowing you are right next to the one you love." - anon. Have a super weekend and I'll see y'all on Monday! PS - I often get asked about the photos so I've decided to save a little time and just give you the info' in advance. I took this one at a diner in Sedona, AZ sometime in the early 1990's. The diner is closed now. I think it was for an assignment about using primary colors in a photograph OR capturing the feel of a place through details. I'm old, can't remember which one exactly but I know it was one of those. This post could be for Captain V's youngest who truly loves his tomato sauce [or ketchup as I think you'd know it]. Me? I'm a grainy mustard kind of gal and would love to be sitting in this diner with Captain V and his kids enjoying the vibe. WHAT - i LOVE that you guy's do this back and forth - so cute and loveing!!!!! Love it! Has a cartoon feel to it - which you know is BIG over here! It could have been an old school diner in DC too! Happy weekend! Ahhh ... PERFECT phrase for a PERFECT photo! I love your Friday posts. Love them all, but I really look forward to Fridays :) have a wonderful weekend. My daughter would eat ketchup sandwiches if I let her. Another winning combo from you two! 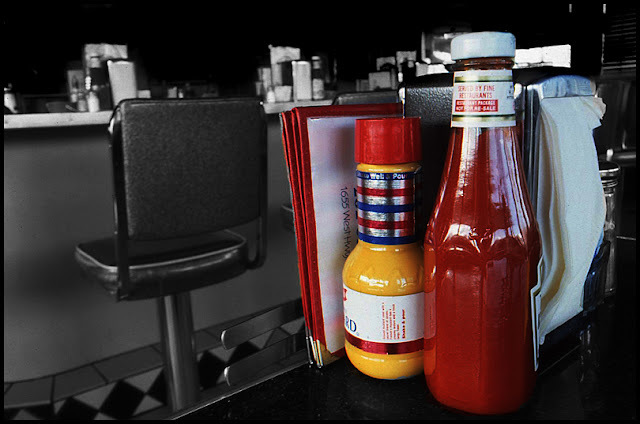 Heinz ketchup bottle is oddly comforting as it's origins are in home town of Pittsburgh. Have a great weekend Jeanette! Just looking at this photo makes me laugh. The Mustard and Ketchup look very happy together. I know this is quite late to comment but I hope some rain made its way up to you. We had a fabulous rain tonight with a lighting show that just wouldn't stop. So exciting. This is a great composition. I like the use of primary colors!